“Palliate is a Latin word meaning ‘to cloak’ and in medical terms it’s a reference to offering relief where there is no cure…” and “There’s a wonderful quote from John Oxenham ‘Death begins at life’s first breath but life begins at touch of death’. One thing that we often forget is that people who have terminal illnesses are very much alive, have every ability to contribute to society through relationships and love and they need our support. The mark of our society is how we care for those who need our support the most.” R. Stokes, 2011. 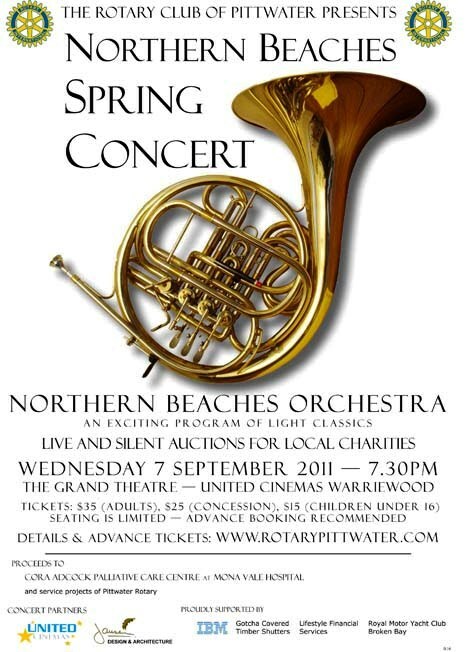 The Annual Spring Concert organized by the Rotary Club of Pittwater focuses each year on raising funds to support a particular project in the community. 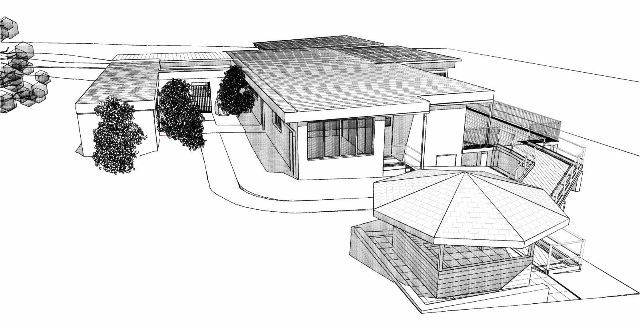 In 2011 their objective is to support the extension and modernisation of the Northern Beaches Palliative Care Centre. 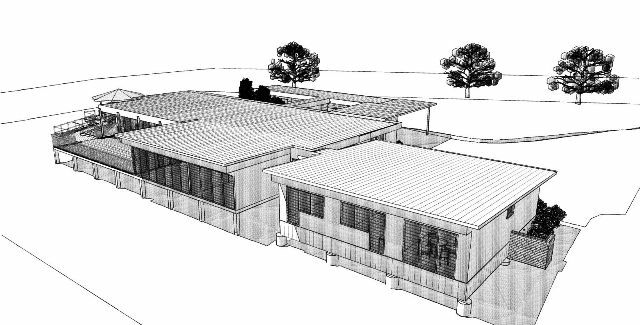 The sketches kindly provided by Mr Jansen of Jansen Design & Architecture, Avalon (below) are what is envisioned. The Cora Adock Palliative Care Center operates out of a cottage on the Mona Vale Hospital campus. This centre is for those diagnosed with a life-limiting illness and their families. The aim is to provide comprehensive support for the person, the carers and the family. It is available to people in the Pittwater, Manly, Warringah council areas. Above: SE View. Below: NW view. Drawings are copyrighted by Emile Jansen, 2011. All Rights Reserved. Membership of a Rotary Club is open to all cultures, races, and creeds, and is available to someone with a commitment to serve the community by applying their skills and experience in accordance with the aims and objects of Rotary. other have extensive Rotary experience. We usually meet at the Royal Motor Yacht Club in Newport. Formal meetings – with guest speakers and a structured program – alternate with informal meetings focusing on fellowship. Wednesday meetings normally start at 7.15pm and finish by 8.30. Many members come for a meal in the RMYC Bistro prior to our meetings. As a member, what is my commitment? Rotary is a voluntary organisation whose members are busy people. We all participate within our own levels of availability, skills and experience. Regular attendance at our meetings is important but it is not expected that you will attend every week. The focus is on contributing to club initiatives and projects and engaging with business and community leaders based on our personal skills and experience. Membership fees are about $140 for each six months’ period. Members are not expected to make personal donations, but rather to participate in club projects, including fundraising activities and to empower community resources by leveraging the Rotary brand, skills and experience. We encourage members to involve their families in club meetings and all other activities. It’s easy: Talk to a member or call us. As with most clubs, there is an information and nomination process. We will make sure that you, as a new member, are given the opportunity to join one our projects and assigned tasks which you feel best suits your skills and experience and may give you the best sense of achievement and enjoyment. We hope that you will feel you are adding another dimension to your life in that you, your family, Rotary and that the community will benefit from your engagement and commitment. Come along to one of our club meetings. You’ll be more than welcome and we’ll be happy to answer your questions. What is Rotary’s Motto ? Rotary logo; Rotary’s early emblem was a simple wagon wheel (in motion with dust). It was designed in 1905 by Montague M. Bear, a member of the Rotary Club of Chicago who was an engraver. He designed the emblem to represent both civilization and movement. Most of the early Rotary clubs adopted the wheel in one form or another. adopted at the 1929 International Convention. ShelterBoxes are a humanitarian organisation run by the Helston and Lizard Rotary club in Cornwall, England. The concept was invented by Tom Henderson an ex Royal Navy search and rescue diver who realised the need for a lifesaving shelter kit to the people directly affected by disaster be it civil or natural. The boxes are sent to anywhere in the world in a few hours notice. They provide the essentials for up to ten people for an extended period. 30. 00 for 450, 00 people have been distributed in 6 years (2007). Requests for these have been made and delivered to Oxfam, UNHCR, Mercy Malaysia, Red Cross etc. During the Asian Tsunami they provided shelter for 150,000 people in India, Sri Lanka, Indonesia, Maldives, The Andaman and Nicobar islands and more recently the destroyed islands of Nias and Simileu.